Mbarara District police commander Jaffar Magyezi has spent 19 days in military detention on unknown charges. Mr Magyezi was arrested last month at his duty station in Mbarara and brought to Chieftaincy of Military Intelligence headquarters in Kampala. Initially, it was said he had been summoned to Kampala by the Inspector General of Police, Mr Martins Okoth-Ochola. 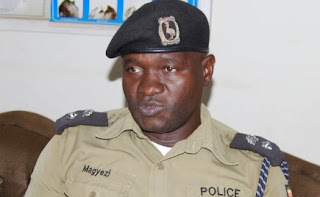 However, police spokesperson Emilian Kayima denied knowledge about Mr Magyezi’s whereabouts or charges against him. “What I can say is he is not yet working. Why don’t you talk to those who arrested him?” Mr Kayima said. The army spokesperson, Brig Richard Karemire, last evening said Mr Magyezi is a “free man”. Mr Magyezi is among several police officers arrested by military intelligence operatives on unknown offences. He served as the officer-in-charge of Mbarara Police Station before he was elevated to acting district police commander in 2014 and confirmed in that position in 2015. The former IGP, Gen Kale Kayihura, was also arrested alongside other top officers.